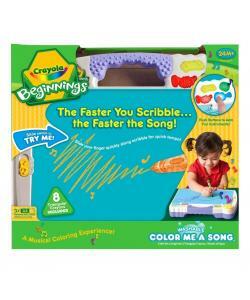 Crayola Beginnings Color Me a Song allows toddlers to create original music with their scribbles. The faster they scribble, the faster the song! 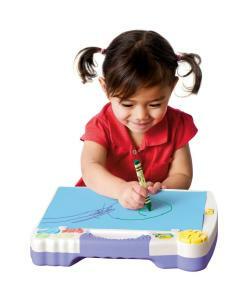 If coloring and music are your kid's two favorite ways to play, then Crayola's musical coloring set is for them. Four original songs inspired by salsa, rock, swing, and country are activated by your child's coloring on this innovative Crayola coloring set. Plus, the four instrument buttons will help develop your child's motor skills as they have fun coloring and playing music.